Rockfalls tend to happen more often in spring, when slopes above highways can be affected by changing temperatures and increased rainfall. The Ministry of Transportation and Infrastructure’s Rockwork Program uses a variety of techniques to keep rock and debris off highways. But rockfalls are a natural process and cannot always be prevented. In those cases, the ministry and its maintenance contractors spring into action to ensure the highway is cleared and safe for travellers. Maintenance Contractors routinely patrol highways to ensure they are clear of debris such as rockfall. If you happen to come across a rockfall, it’s best to stay in your vehicle and contact the local maintenance contractor. Use your mobile phone to access the Report a Problem mobile site, which will help you identify what phone number to call. For more information about what types of highway problems should be reported this way, and to view a map showing highway maintenance contractors by region, visit the maintenance contractor webpage. Most rockfalls are small (about the size of a fist), and can be quickly cleared from the highway by the local maintenance contractor, who documents the event and submits the information to the ministry. The maintenance contractor can begin clearing the highway if the slope is secure. Depending on the size of the fallen boulders, blasting and/or drilling may be needed to break them into moveable pieces. 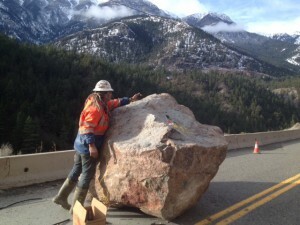 We saw this back in January 2015, when a 7ft by 7ft rock fell on Highway 12 near Lytton. On the other hand, slope stabilization work may be required. The Rockwork Program uses various slope stabilizing methods depending on the site conditions . Rock Scaling: removing loose rock from slope by workers (rock scalers) suspended on ropes using pry bars. Trim Blasting: used to remove rock from the slope by drilling holes into it and loading with explosive. Rock Bolting: rock bolts are installed to hold large blocks of rock in place. Rock bolts are steel bars cemented in drill holes and tensioned. Slope Mesh: used to direct small rocks into the highway ditch. Shotcrete: sprayed concrete used to prevent rocks from loosening. Horizontal Drains: used to lower water pressure in slopes. Catch Fences: used to intercept high energy rockfalls. Rockfalls aren’t always caused by rainfall and changing temperatures. For example, growing tree roots, forest fires, and animal activity can also become triggers. The “Watch for Falling Rocks/Debris on Road” roadside sign indicates a location where there is a rockfall risk. If you come across this sign, or if you are driving through any rock slope area, pay attention and watch for debris on the road ahead. And, of course, it’s not an ideal place to pull over. British Columbia’s mountainous landscape means our highways pass through some challenging terrain. The ministry’s Rockfall Program is dedicated to reducing the rockfall hazard for highway travellers. National Engineering Month TranBC Trivia: What area of BC do rockfalls happen the most? Post your answer to the comments section below. And for the post about random rocks on the road, if you think your a better rock scaler tou should give it a shot. Because most people wouldnt last a minute. Every site ive been on has been done in compliance to any ministry specs,as well as our own safety. And therss no budgett in the world that can stop all rockfall in bc.. its one of those things unless youve been up there hanging from a rooe you have no idea. So will the proposed catch fences at Three Valley on the Trans-Canada stop boulders the size of pickups like the one that blocked the highway the day after the Minister of Transportation met the Mayor of Revelstoke and the MLA for Columbia River-Revelstoke to talk about, among other issues with the highway, rockfall at Three Valley? Safety in Three Valley Gap near Revelstoke is a priority for our ministry and Three Valley Gap has been identified for further rock fall mitigation. However, while typical rock slope stabilization involves rock scaling, rock blasting and slope meshing, standard rock fall fences can’t withstand the snow loads and snow avalanches at Three Valley Gap. We’re investigating designs for a new rock fall fence system, with the intent to test it at Three Valley Gap. My father was killed rock scaling at 3 Valley Gap in 1986.This section of highway i can imagine has caused many motorists and workers lives.HAS the MOT looked abroad for solutions from other countries to finally come up with a viable solution? Sorry to hear of the loss of your father, at Three Valley Gap. I’m checking for an answer to your question about where we’ve sought solutions to the rockfall issues at that location, and am seeking an update on the status of our latest project to install fencing that will capture rocks, but stand up to avalanche flow. Our request for proposal for an avalanche-compatible rockfall fencing system reached international designers and suppliers, including those in Europe. Our new rock fall fence system is now 90 per cent complete. The system is designed to minimize the risk of damage caused by snow loading and avalanche activity, without compromising the effectiveness of our recently installed remote avalanche control system. The new fence will provide some level of improved rockfall protection this winter, even in its unfinished state. The project is in shut-down now during winter and final completion will occur in the spring. If the pilot is successful, we will consider this type of system for other rockfall areas in the Three Valley Gap. In addition, a new 33-metre-long lock block retention wall was installed this autumn to reduce the risk of large boulders falling. things that make you go hmmmmmmmmmmmmm………. Thanks for your comment. As you might be aware from another recent post in the Revelstoke Mountaineer, we’re investigating a new rock fall fence system, to test in this area. Standard rock fall fences can’t withstand the snow loads and snow avalanches at Three Valley Gap which means we need a fence that can hold up, without compromising effectiveness of new remote avalanche control system. Thanks again for connecting with us here. This evening as we were driving up highway 1 northbound we swerved to avoid a large rockslide on the northbound lane 10 km south of Boston Bar. After doing research on Drive BC I came across the number for reporting non-emergency events and was given the number for Emil Andersen Maintenance. After calling the number and being put on hold for several minutes I was told the company was not responsible for that area of the highway and was given the number for VSA Manintenance. After calling them and reporting the problem and location I was told they were not responsible for that area of the highway either and in fact it was Emil Anderson Manintenance. Neither company would take down the report and neither company would confirm who was responsible for that area of the highway. After calling the first company back, I was told they could do nothing as they were not responsible for that part of the highway. Who may I ask then, is responsible for this large rockslide? More importantly who will listen to the report and get it off the highway before a major accident occurs. Extremely disappointed with the service from both these companies. Thank you for letting us know. We shared this message with both maintenance contractors and our local area manager for review. This area does, in fact, fall under the jurisdiction of Emil Anderson and someone from this company has recently reached out to you via the email you provided here to follow up on this matter. Could you confirm that the email used for this site is the best way to reach you – or if there is another, better way to chat? Thanks so much! Many thanks tranbceditor for responding and contacting the maintenance companies responsible for this confusion. I have responded to the email and will continue correspondence there. Glad to hear this Amanda – thanks for letting us know! the preventing all rockfall comment was a PURELY sarcastic comment (which I felt was obvious), as I fancy myself to be a bit of a wisenheimer. Also, I appreciate your concern but my foot is nowhere near my mouth as the first time I commented on this matter was April 18, and I did not hear of any work going on there until sometime in September.I also prefer stretching prior to such a maneuver. Get over yourself Ashley. There isn’t an unlimited budget for this kind of stuff. But more importantly why does my genuine concern for the safety of the general public, yourself included, seem to bother you so much? Thank you for dancing around my questions. Also, thank you for informing me that you are unable to prevent all rockfall I will put that in my back pocket for later. In the future however if you are unaware of the answer to one of the questions you should just ask me! We do have a comment moderation policy (available here: http://tranbc.ca/about/moderation-policy/#sthash.SPXjep7M.dpbs). Please have a look. If any comments fall outside of these (ie defamatory, threatening, advertising, etc.) we do remove them to keep the community useful/helpful for others. haha 2004? !do they take in consideration the freeze and thaw factor? that’s over ten years ago! Thanks for your continued interest in the work we do to keep BC highways safe. The safety of the travelling public is our first priority. Since the 1970’s we have had a dedicated stabilization program aimed at reducing rockfall on BC Highways. With BC’s mountainous terrain and changing weather conditions it is not possible to prevent all rockfalls from occurring as it would be cost prohibitive to do so. Our geo-technical engineers monitor the stabilization work our contractors do on BC highways to ensure that our standards are being met. We try to coordinate stabilization activities in advance of paving projects whenever possible. And How long will I need to stay tuned for? Trim Blasting – has been performed to remove rock from the slope by drilling holes into it and loading with explosive and blasting. Shotcrete – has been applied which is sprayed concrete that is used to prevent rocks from loosening. Rock Bolting – rock bolts have been installed to hold large blocks of rock in place. Rock bolts are steel bars cemented in drill holes and tensioned. Many of these activities are done high on the slope and are not easily visible from highway level. but I’m sure I just didn’t notice….. The last major phase of stabilization work that would have caused significant traffic disruptions was in done 2004. Smaller less disruptive work was done as recently as 2012. In regards to the previous posts about 3 valley gap l would like to add that I also have known this to be a problem area. There is always rock on road when I drive through and especially avoid the area at night. I have not ever seen or heard of any ‘mitigation’ either…. so curious as to what exactly was purchased with 1 million dollar budget? We have sent your question forward to the local area manager for an answer. Stay tuned. I drive through a twisty canyon every time I go visit my grandma. 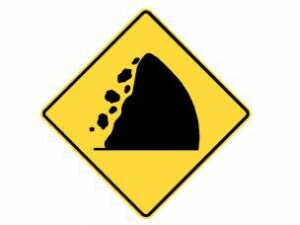 There are a few “rock fall” signs on the road, so I am always paranoid about it happening while I’m driving. From now on, I will pay close attention to the road, in case there are any rocks that have fallen already. I did comment on this blog and the post stayed there ‘waiting for moderation’ for a while. Then it disappeared. That’s very odd and I’m sorry that happened. We do have a moderation policy (linked at the top left of the blog) so we make sure comments meet those requirements (ie not sexist, racist, etc.). Didn’t see anything from you on this blog beyond these latest comments. Thanks for reposting to make sure we saw it. Repeating my comments that seem to have disappeared. Are there any plans to do anything about rockfall at Three Valley on the Trans-Canada? Last fall a rock went through the trailer of a commercial transport. If it had been 50 feet further forward it would have killed or seriously injured the driver. Since then there has been another fall of rocks easily big enough to kill, although I think they stopped JUST short of the highway. Hi Nicholas, Thanks for the question. Sorry if you haven’t seen them but we haven’t removed any of your previous comments. We only do so if they fall outside our moderation policy. They’re all still on the various blogs you’ve previously commented on. This is the first you’ve commented on this blog however. In regards to rockfall at Three Valley Valley, I’ll connect with our rockwork team to share what we’re doing in that area. Regarding your comment, our ministry has a dedicated maintenance program aimed at reducing rockfall hazards throughout the province. More than $1 million has been invested in rockfall mitigation measures at Three Valley Gap and we’ll continue to monitor conditions there, doing additional work based on provincial rockfall priorities. 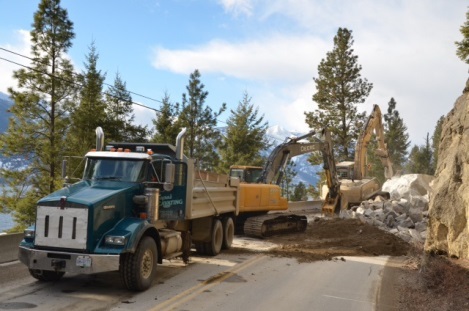 We track rockfall activity along all BC highways and for significant events such as the event you refer to, we have geotechnical engineers investigate and determine the level of stabilization work needed. That is interesting because I don’t remember any rock scaling or other mitigation work being done at Three Valley in the last 7 years. The only ‘mitigation’ I am aware of is debris removal from the travel lanes and the ditches. Oh and I think there was some renewal of the EXISTING lock blocks. N.B. Both the rockfalls I mentioned happened East of the lockblock wall, as did another very serious rock fall that happened a few years ago. So the lockblock wall didn’t help. I lost my father in the 80s to a rock scaling accident at 3 Valley Gap.This section of highway has proved to be a nightmare to maintain and navigate.Common sense would say design higher kn fencing and supports and cage the monster in. Sorry to hear of the loss of your father while working at 3 Valley Gap. Safety in Three Valley Gap near Revelstoke is a priority for our ministry. However, while typical rock slope stabilization involves rock scaling, rock blasting and slope meshing, standard rock fall fences can’t withstand the snow loads and snow avalanches at Three Valley Gap. I’m looking for the latest information, on a new rock fall fence system we have in the works for testing at Three Valley Gap. I’ll get back to you here, with an update, when I have it. Our new rock fall fence system is now 90 per cent finished. It’s designed to minimize the risk of damage from snow loading and avalanche activity, without compromising the effectiveness of our remote avalanche control system. The project is in shut-down now during winter and final completion will occur in the spring. The new fence will improve rockfall protection this winter, even in its unfinished state. In addition, a new 33-metre-long lock block retention wall was installed in autumn, to reduce the risk of large boulders falling onto the road. When is the MoT&I going to improve BCHwy14 from the 4 lanes to Kangaroo Rd? This stretch of road is in bad shape and has rocks on the road way daily. There is no cell service in this area. The highway really really needs improvements badly on this 1.4 km section. Thanks for sharing your concern with us. We have sent your comments forward to the area office and will let you know what we hear back.